HAZELWOOD, Mo. -- When Ken Hitchcock goes back to Columbus on Sunday, forgive everyone if the 59-year-old doesn't get all emotional and teary-eyed about it. Maybe another time and another place, especially if it was Hitchcock's first job, there would be mixed emotions. But the veteran coach has been there, done that. This will be Hitchcock's third time going back to a place he once called his bench. 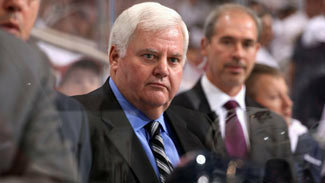 Hitchcock, who has coached in Dallas, Philadelphia, Columbus and now St. Louis, was with the Jackets for four seasons before being fired in 2010, the third time a franchise has relieved him of his duties. "I've been out two years (in Columbus) doing work for them," Hitchcock said of the Columbus organization. "I've developed a friendship with obviously the American (Hockey) League guys and some of the business people there just for fun, getting to know other people in the business. "If it was (a big deal), I'd tell you. It isn't. But it was hard in Dallas." Yes, Hitchcock admitted that at one time, it was difficult, and that was when he was fired from his first National Hockey League job with the Stars, for whom he had won a Stanley Cup with in 1999 and spent seven seasons. "I said to people it was tough for me going back to Dallas," Hitchcock said. "It was really hard because we were in on the design on some of the stuff in the building. We were in on the design of the locker rooms, coach's offices, training rooms, murals that are up there that are still there ... we were in everything. Mr. (Tom) Hicks (who owned the Stars at the time) included us in everything. So it was really hard for me to go back there. Very emotional." But this will be just another game for Hitchcock, who is 6-1-2 since taking over the Blues after they fired Davis Payne on Nov. 6 following a 6-7 start. The Blues went from 14th in the Western Conference at that time to sixth heading into Saturday's action, and they've done it by buying into a style that has seen Hitchcock win at all levels he's been at. "When we do it, they have found value in puck management and checking," Hitchcock said. "They've found real value in managing the three lines on the ice and checking. They've seen through a lot of video how that can manage the game properly and create scoring chances. "I think the toughest thing in this league is to convince the players that the harder they check, the more they score. I think that's where the players are getting a good feel for ... if I compete and check, then that's how I get the puck because just waiting for the game or waiting for the puck to come to you doesn't work in this League. Teams are too good." In the initial aftershock of Payne being let go, it's natural for players to react in a favorable way, simply because they understand that it's now time to hold the players accountable after management serves notice by relieving a coach. "Any time you get a shakeup like a coach getting fired, it sends a message through the whole team," said veteran winger Jamie Langenbrunner, who played for Hitchcock in Dallas. "Things weren't going horribly here. We were right around .500, but still the message was sent we expect to be bigger and better. I think that was a wake-up call for everybody. "Unfortunately, Payner pays the price for it, but I think the message was heard loud and clear." And the Blues have responded to Hitchcock's demanding style of play with a smothering style that has yielded only 11 regulation/overtime goals in nine games. Although the power play still has work to do, the penalty kill is much improved and the 5-on-5 play is spectacular, allowing only six goals in the nine games under Hitchcock. "It's attention to detail, just doing the little things," said goalie Brian Elliott, who leads the League in goals-against average (1.34), save percentage (.951) and is tied for shutouts with three to go with a 9-1 record. "If you go around the room, that's what guys would say. It's being accountable and knowing why you're doing the things you do. He has a good way of explaining how and why you're doing things. When you know why you're doing it, then it helps a lot. Everybody can read off each other easily. It's simplifying our game and playing to our strengths and doing it for 60 minutes. "He expects a lot out of you, but I think in the end, he enjoys being around the guys. It's nice to come in to see a smiling face every morning, someone you can go to with a question and you don't feel uncomfortable. He knows what he's talking about. He's been around the game so long. Anything you get out of him you can probably trust is the right thing." Defenseman Kris Russell, who played for Hitchcock in Columbus and who will be making his return to Nationwide Arena for the first time since being traded to St. Louis Nov. 10, said of Hitchcock: "He brings structure, leadership. He's a guy that's been there. He's won a Cup obviously. He took a team in Columbus to the playoffs when they've never reached it. Those records speak for themselves. "I'm sure he wants us to play as well as we can to get a win in there, but Hitch is a coach that is pretty even-keeled every game. He takes it one game at a time. You can't be too high, can't be too low in this League or you go for a ride." The Blues are enjoying the ride they're on now, and as long as they can adhere to Hitchcock's message, they may just keep themselves in the thick of the rugged Western Conference race. "For me, the controlling of the three lines ... when we do it well, we can play with and against anybody," Hitchcock said. "We did it for two periods and five minutes in Pittsburgh (Wednesday) as well as we've ever done it since I've been here. We were really good. If we do those things, then we can beat anybody. That's where, to me, the buy-in has started. When your best players do it, then everybody else has to follow. "It's not fun to play that way. It's a constant tug-of-war. The more success you have, the more they want to go back and play a different way. It's not easy playing that way. It's not easy at all. Not fun. It's very rewarding, but it's not fun. But when those guys buy in and play that way, we're very good."